1.1 Do you want to set an alarm but not set your iPhone to mute? Here’s a guide that will save you from sleeping through your alarm. Read on. 1.2.1 Open the Clock app from the Home screen or Control Center. 1.2.2 Tap Alarm at the bottom of the screen. 1.2.5 Repeat: Tap to set up a reoccurring alarm. 1.2.6 Label: Tap to give your alarm a name. 1.2.7 Sound: Tap to pick a sound that plays when the alarm goes off. 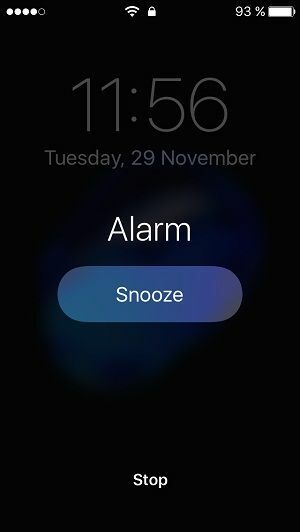 1.2.8 Snooze: Turn on to see a Snooze option when the alarm goes off. 1.4.2 Open the Clock app and tap Alarm. 1.4.3 Tap Edit in the upper-left corner. 1.4.4 Tap the alarm, make your changes, then tap Save. 1.4.6 Swipe left over the alarm and tap Delete. 1.4.7 Tap Edit, tap , then tap Delete. 1.4.8 Tap Edit, tap the alarm, then tap Delete Alarm. 1.5.1 Do Not Disturb and the Ring/Silent switch don’t affect the alarm sound. If you set your Ring/Silent switch to Silent or turn on Do Not Disturb, the alarm sound still goes off. 1.5.3 Check the volume on your iPhone. If your alarm volume is too low or too loud, press the volume button up or down to adjust it. You can also go to Settings > Sounds & Haptics to adjust the volume. 1.5.4 If your alarm only vibrates, make sure that your alarm sound isn’t set to None. Open the Clock app, tap Alarm, then tap Edit. Tap the alarm, then tap Sound and choose a Sound. 1.5.5 If you use iOS 10 or earlier and you connect headphones or speakers to your iPhone, the alarm plays through the connected device instead of the built-in speakers. 1.5.6 If you use iOS 11 or later and you connect headphones or speakers to your iPhone, the alarm plays at a set volume level through the built-in speakers on your iPhone. It doesn’t play through your headphones or speakers. Do you want to set an alarm but not set your iPhone to mute? Here’s a guide that will save you from sleeping through your alarm. Read on. Open the Clock app from the Home screen or Control Center. Tap Alarm at the bottom of the screen. Label: Tap to give your alarm a name. Sound: Tap to pick a sound that plays when the alarm goes off. Snooze: Turn on to see a Snooze option when the alarm goes off. Open the Clock app and tap Alarm. Do Not Disturb and the Ring/Silent switch don’t affect the alarm sound. If you set your Ring/Silent switch to Silent or turn on Do Not Disturb, the alarm sound still goes off. Check the volume on your iPhone. If your alarm volume is too low or too loud, press the volume button up or down to adjust it. You can also go to Settings > Sounds & Haptics to adjust the volume. If your alarm only vibrates, make sure that your alarm sound isn’t set to None. Open the Clock app, tap Alarm, then tap Edit. Tap the alarm, then tap Sound and choose a Sound. If you use iOS 10 or earlier and you connect headphones or speakers to your iPhone, the alarm plays through the connected device instead of the built-in speakers. If you use iOS 11 or later and you connect headphones or speakers to your iPhone, the alarm plays at a set volume level through the built-in speakers on your iPhone. It doesn’t play through your headphones or speakers.